I realised the other day that my seaweed shawl was going to need more yarn than I had, so today I rectified that. 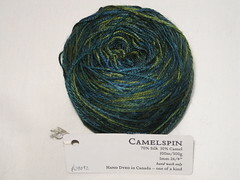 I ordered some of the discontinued stuff that inspired the whole project from an online yarn shop in the UK. 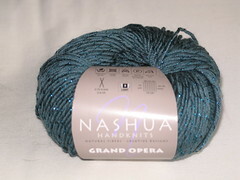 And then I went yarn shopping with a friend and bought some gorgeous new yarn. It was well-timed as I was struggling with some computer issues this morning and was feeling very grumpy. But I didn't think about my computer once after I had walked into the yarn store. All thoughts of anything but my shawl vanished magically. 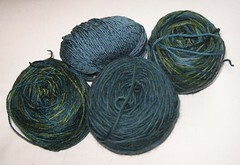 I just looked at colours, petted pretty textures, and had a great deal of fun picking out some more yarn. (Best yet, when I got home, the Computer Fairy -- aka my sweetie -- had fixed everything). 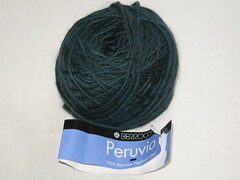 I wanted another ball of the variegated alpaca that I already had, but I bought 3 new yarns as well, all with some xmas present money. The most luxurious and gorgeous is the silk-camel. It was shockingly pricey, but that's just what xmas money is for, right? So now I'm all set to knit up a storm. Glad to hear your computer woes were fixed when you got home!